With behavior outbursts on a constant rise, Oregon educators look toward solutions for creating safer and more effective learning environments. The year was 2005 and he was standing face-to-face with a young student who had autism. Vincent Chirimwami had been assigned the student’s Instructional Assistant in a self-contained classroom at the Pioneer Special School Program in Portland, and at that moment, the learning curve in front of him seemed daunting. One year earlier, Chirimwami had left a career as a French teacher in Congo and Tanzania and come to the United States as a refugee. In all those years spent teaching French in Africa, autism — or any form of learning disability for that matter — was never part of the dialogue about students with special needs. 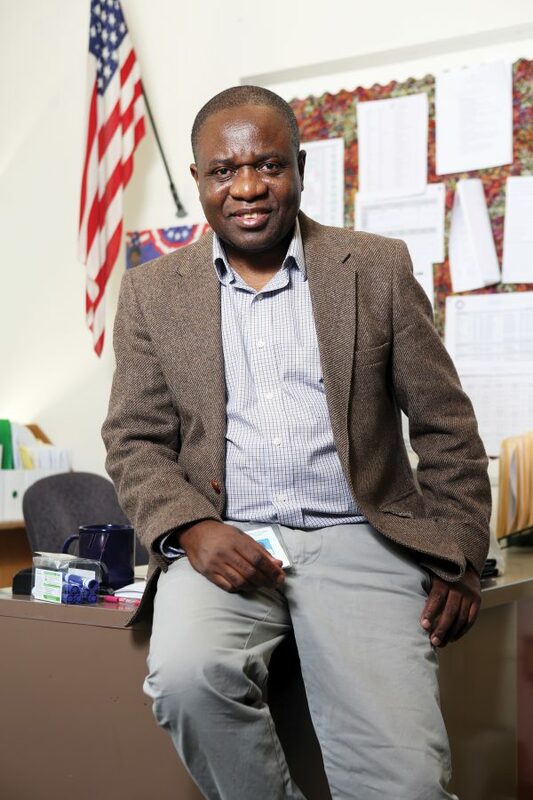 Four years after arriving in the U.S., Chirimwami earned his Bachelor's degree with a teaching license from Portland State University and returned to the Pioneer program as a full-time Special Education teacher. That year, he was struck so severely in the face by a student that he spent a full day in the hospital and missed six days of work afterward. The reality of what it now meant to be a teacher in the American school system had pelted him as squarely in the face as his student’s palm that day. But did it deter him from this career as a Special Education teacher? Not for one minute. “It didn’t make me question what I was doing because I had known that student for four years prior to that. I knew he wasn’t mad at me — something was going wrong, and I was just the immediate person in his range,” he says. As Chirimwami and educators across Oregon attest, outbursts like this aren’t a personal affront to the teacher or instructional assistant. At their most basic form, educators see these disruptions as a raw communication tool. Something in the system just isn’t working right for that student. Chirimwami knows school suspensions are not the answer to disruptive behaviors. "When we exclude students, they feel like they are not part of the community and the cycle continues," he says. Decades of disinvestment. We all know the phrase and what it looks like in the classrooms and worksites where we spend our days. Oregon schools have lost counselors, school nurses, social workers, and special education teachers. Treatment centers and differentiated options for students have closed, without additional services added to traditional classrooms. As resources continue to decline for mental health services and social supports in and out of schools, the burden increasingly falls on educators to address these behavior challenges, while continuing the monumental task of teaching ever-growing class sizes and caseloads. Over the past eight years, Chirimwami’s career has taken a few twists and turns — he moved out of the Pioneer program and into a Structured Routine Center at Beaverton High School, then into two different middle schools. Now, he’s found his calling as a Special Education teacher at Gilbert Heights Elementary in the David Douglas School District. He recognizes the visual power he brings as a male teacher of color to this school, especially for the young black boys who are disproportionately enrolled in Special Education services. “They finally have a teacher who looks like them, talks like them. I can share my personal story and they can relate. That’s huge,” he says. He also loves the age group more than he expected to — “you can pull your finger up to your mouth, and generally, they look at you and understand you’re asking them to be quiet” — but severe behavior outbursts are still a part of his day-to-day experience, as they are for so many educators in public schools across Oregon and the nation. Various research points to the growing prevalence of “disrupted learning” — meaning those behavior outbursts that can have a lasting impact on a classroom long after the pencil (or chair) is thrown or foul word is yelled. There are nearly as many types of disruptive behaviors as there are students to exhibit them. It’s not a new issue by any means; a study of teachers by the American Federation of Teachers done over a decade ago showed that, in 2005, 17 percent of educators lost four or more hours of teaching time per week because of classroom disruptions, and in urban secondary schools, that percentage climbed to 24. Knowing the issue was of high concern to Oregon educators, delegates at the 2016 OEA Representative Assembly urged OEA’s Special Education Task Force to conduct a statewide survey about disrupted learning patterns in our schools. The survey, conducted last school year, garnered responses from more than 1,650 educators — both Special Ed and General Ed — about behavior issues experienced in today’s classrooms. 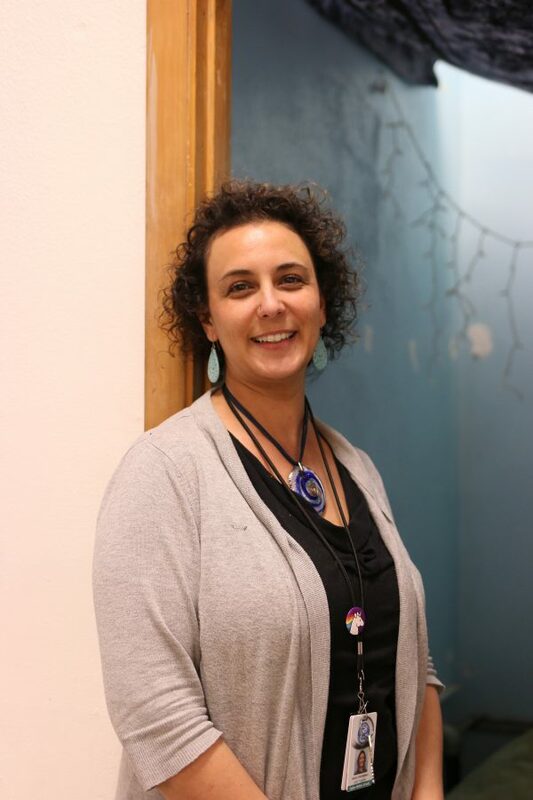 Missy Love, an LRC behavior program teacher in the Newberg School District, chairs OEA’s Special Education Task Force and helped write the survey last year. “We’re taking all of this information and are now in the process of meeting with our partner organizations, like COSA and the PTAs, to move it forward. It’s so important for our communities and coalition partners to know what’s going on in our schools because unless you work in that school, you really have no clue. These behaviors were not new to my staff, but even the people you work with may or may not know what’s going on in the classroom next door,” Love says. Vincent Chirimwami came to the U.S. as a refugee from Congo about 10 years ago. Many of his students have similar stories - and those shared experiences have become a powerful teaching and classroom management tool for Chirimwami at Gilbert Heights Elementary. One of the key outcomes of the survey came about this past February, when OEA engaged in a dialed-in effort during the short legislative session to inform policy-makers about the prevalence of escalated and often dangerous student behaviors. At the beginning of the month, hundreds of educators flooded the Capitol for OEA’s Lobby Day and shared their stories about emotional breakdowns, violent outbursts and other distressing symptoms of inadequate resources in our schools and our state. Member stories about disrupted learning were then collected throughout the session and hard copies were delivered to each Oregon legislator every day (read the full story project on the Today’s OEA online site: http://todaysoea.org/articles/educator-stories-disrupted-learning-environments). During the month of February, OEA members also testified in front of the State Board of Education about the realities they experienced day-to-day. Their heartbreaking stories went beyond the now ‘standard tale’ of stretching resources and ballooning class sizes. The testimonies revealed deep fears and feelings of inadequacy in dealing with students who were experiencing intense moments of personal crisis that often manifested into unsafe learning conditions for every person in the classroom space. The response in the State Board of Education meeting room that day was hushed and shocked, but the outcome since then has been full of promise. At OEA’s urging, Gov. Kate Brown formed the Deputy Superintendent’s Advisory Committee for Safe and Effective Schools for ALL Students, a convening group of educators including both Chirimwami and Love, as well as Laura Scruggs, general education teacher from Springfield and parent of two boys with autism, Diana Garcia-Hernandez, an ESP from North Wasco, and Erin Whitlock, a behavior specialist and consultant in OEA's Center for Great Public Schools. The focus of the Committee will be to study the issue of disrupted learning and develop a comprehensive policy package for enactment in 2019. Of course, educators like Love who have vast experience working with behavior issues already come to their jobs every day with ideas on how to reshape the system that better meets our students’ needs. “The old-school way of kiddos sitting in desks is no longer the way to go — maybe for some, but definitely not all. These kids who walk through our doors are not all round pegs that need to fit in a round hole. We need to do what is best for that student at that time, and some of that does include lower class sizes and smaller caseloads, more access to mental health specialists and stronger parenting support,” Love says. Even a bit of fresh air can help manage disruptive behaviors in Franky Stebbins' English Language Development class. There are deep equity issues at play in this answer, too. Students of color, and specifically African Americans, are considerably more likely to be labeled ‘disruptive’ by their teacher and experience school discipline, yet they are also much less likely to have a teacher of the same race. The U.S. Department of Education Office for Civil Rights caused a national stir in 2014 when it released data showing that black students are suspended and expelled at three times the rate of white students. A fascinating paper out of Western Washington University titled “Teachers’ Perceptions of Students’ Disruptive Behavior: The Effect of Racial Congruence and Consequences for School Suspension” further explores the racial and ethnic congruence of teachers and their students. In the study, African-American students are rated as less disruptive when they have an African-American teacher, while perceptions of white and Hispanic students’ disruptiveness are seemingly unaffected by the race or ethnicity of their teacher. The paper concludes that the underrepresentation of African-American teachers has important implications for black-white gaps in school discipline. One out of every four children attending school has been exposed to a traumatic event that can affect learning and/or behavior. While there are exceptions to every rule, Love says that all but three of her students come from low socio-economic households, and all but one of them are male. “Male, low SES — those are most often the kids who walk through my door. How do we interrupt that? It goes back to what that ideal school looks like,” she says. She tells the story of one of her young boys who, each day, seemed triggered by his teacher handing him a piece of paper and a pencil. Simple, physical classroom materials were causing him to outburst in ways that disrupted the classroom flow. So, Love built the student a desk made from a whiteboard. He’s able to show his work in a new way without ever having to touch a pencil and has been much more successful in class. “I have to help our teachers find the ability to be flexible and change what they’ve always done. A little will go a long way,” Love says. 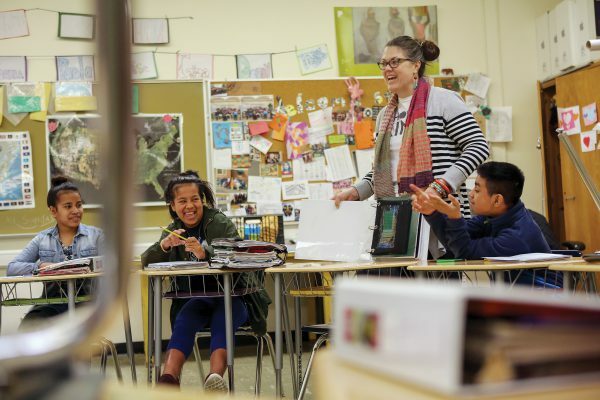 Franky Stebbins' current Newcomers class includes students from ten different language backgrounds; there are nearly 40 different languages spoken at HB Lee Middle School, and 50-60 languages across Reynolds School District. Stebbins’ approach to her students — particularly her Newcomers — is rooted in trauma-informed care. According to a report by the Education Law Center, “at the heart of (trauma-informed teaching) is the belief that students’ actions are a direct result of their experiences, and when students act out or disengage, the question we should ask is not “what’s wrong with you,” but rather “what happened to you?” By being sensitive to students’ past and current experiences with trauma, educators can break the cycle of trauma, prevent re-traumatization, and engage a child in learning and finding success in school." 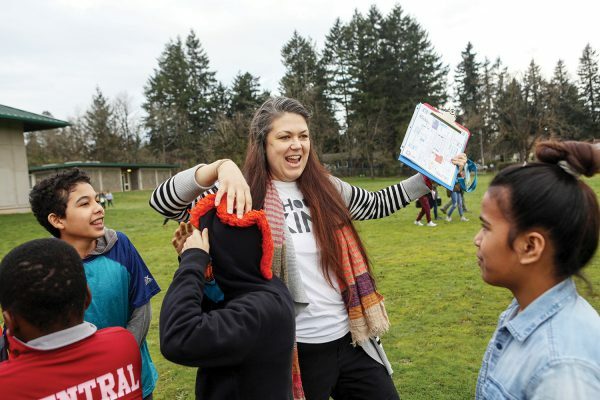 Alexis Hennessey is a relative newcomer to teaching in Oregon. She moved here two years ago from Hartford, Connecticut, where she taught behavior education in an urban alternative school and then an alternative therapeutic program, which served students in specialized placements from DHS, mental health hospitals, or who had been adjudicated. In Oregon, she hoped to find a way to have a stronger impact on behavioral education. Also, like so many teachers, she was feeling a sense of burn-out and needed a change. Alexis Hennessey's behavior classroom is a former ceramics studio, and the blue room pictured here served as the kiln closet. Hennessey painted the space, hung string lights, and obtained donated bean bags to turn the closet into a quiet sanctuary for students experiencing behavior outbursts or emotional crises. Through her Special Education position at Ogden Middle School in Oregon City, she’s able to do both direct instruction on behavioral and emotional skills in a self-contained classroom, and serve as a consultant for kids who are in full-inclusion classrooms and working toward a behavior goal. A state-by-state analysis by the nonprofit research center ChildTrends found that in Oregon, 35 percent of all youth between birth and age 17 had experienced one or two ACEs, and 16 percent had experienced three or more adverse experiences. Across the map, potentially traumatic experiences are common among U.S. children, with more than one in four having been exposed to economic hardship, even in the first five years of life. One in five has experienced parental divorce or separation, and one in 10 has lived in a household where an adult has an alcohol or drug problem. “We think about the students who are throwing chairs, and those are kids who, generally speaking, have experienced trauma. The shocker is that not all those kids are in Special Education," Hennessey says. She recounts a recent meeting about a student who was was experiencing disrupted behaviors in his general education classroom. "Immediately, from what his teachers were telling me, I could tell that this child had some kind of trauma in his past. It doesn’t mean that the parents did any trauma to him — it could have been a divorce or a move at the wrong time. Something caused this child’s brain to be thrown off, and now he can’t be in that typical, low-alert, ‘I’m safe’ space,” Hennessey says. What are your experiences around disruptive learning? Join us at a series of Town Hall conversations this Spring and Fall, hosted by OEA and featuring Colt Gill, Oregon’s Deputy Superintendent of Public Instruction. Find an event near you at: www.oregoned.org/whats-new/disrupted-learning-town-hall-forums.